The Bloomframe window is an innovative window that morphs magically into a balcony within 55 seconds. It offers the user a flexible living environment. By opening the window frame, it is possible to walk out through the facade and enjoy outdoor space. The Bloomframe window can be operated automatically with a single push of a button. The user will add light, air and space, providing him with a genuine outdoor feeling. When closed, Bloomframe offers the same protection against the elements as a standard window. The lower panel is available in a variety of materials from clear or translucent shatterproof glass, to solid panels.Bloomframe is available for new-builds or can be retrofitted into existing buildings. It unfolds in about 60 seconds and features a manual emergency override system in the event of power failure.The unique balcony is engineered by French manufacturer Kawneer France. It consists of tough all-weather materials and controlled by a smooth electronic system. 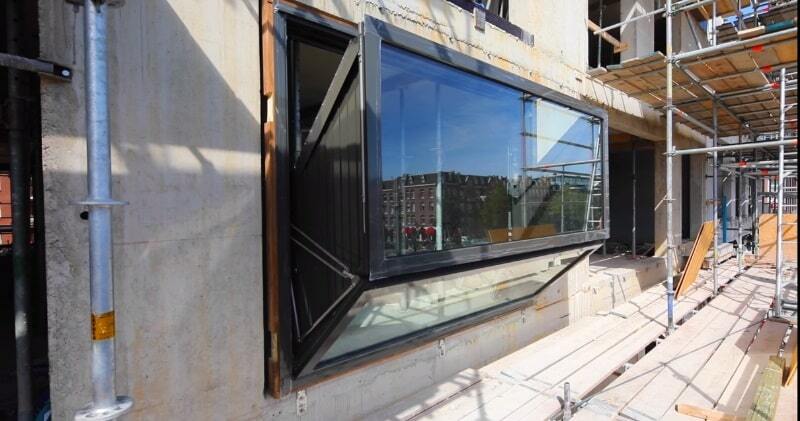 The first models are destined for an apartment building in Amsterdam in The Netherlands.It is automated by a tubular motor set above the upper crosspiece of the window’s interior frame. At the flip of a switch, the window can transform into a 3.4-foot-deep balcony.